В окрестностях города Коимбатур (Тамилнад, Индия) от нападений бродячих собак гибнут пятнистые олени. Учет, проведенный сотрудниками Департамента лесного хозяйства, показал, что в окрестностях Авинаши, Утукули, Пудупалаям, Тулуккамутур, Теккалур, Паланкарай и Утукули обитает 392 пятнистых оленя. Ученые установили, что с апреля 2016 года до первой недели мая 2017 года погибло в общей сложности 42 оленя. Из них 28 оленей были убиты бродячими собаками, пять умерли после попадания под машины, один попал под поезд, а остальные погибли упав в открытые колодцы или умерли от болезни. В связи с тем, что большинство животных погибло от бродячих собак, вновь поставлен вопрос о создания дополнительных водоемов в лесу, чтобы чтобы минимизировать выход оленей из леса на открытые пространства в поисках водопоя, где их подстерегают бродячие собаки. На фото: Олени убитые собаками. Presence of spotted deer herds in the social forestry areas of Avinashi and Uthukuli taluks, which are under the control of Public Works Department, has always been a pleasant sight for animal lovers. 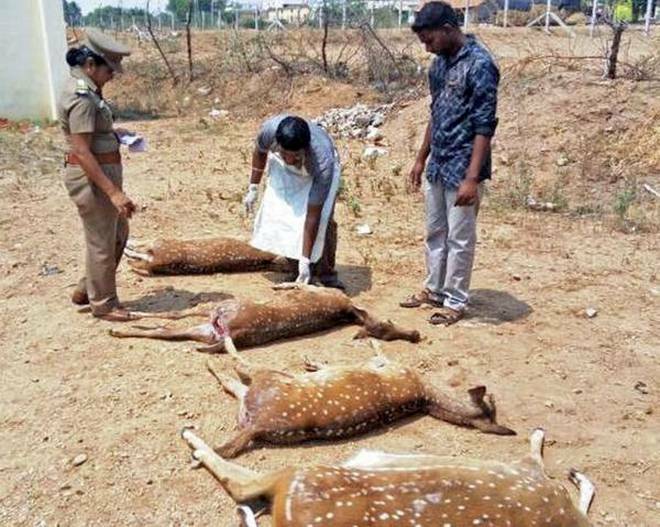 A survey conducted by Forest Department officials a few months ago had enumerated the deer population in Avinashi and Uthukuli taluks at 392, spread over Pudupalayam, Thulukkamuthur, Thekkalur, Palankarai and Uthukuli villages. But the deaths in large numbers in the recent times, mainly due to stray dog attacks and accidents, have become a matter of concern. The statistics obtained from the Forest Department sources reveals that a total of 42 deer had died since April 2016 till the first week of May 2017. Of them, 27 deer died in 2017 itself till May 2. Segment-wise, 28 deer were killed by stray dogs, five died after hit by cars/lorries, one run over by train and remaining were dead after either falling into open wells or sickness. Even though the herds are present in social forestry areas under the PWD control, the Forest Department officials are now taking a serious note of the rising deaths and also taken the lead role in trying to minimise mortality. “Since majority of them been killed by dogs, we have sought the cooperation of panchayat administrations to relocate the stray dogs,” District Forest Officer A. Periasamy said. The need to go in search of water outside the respective hamlets due to rise in population is cited by activists like K. Ravindran, who is the president of Nature Society of Tirupur, that makes the deer vulnerable to road accidents. “Fencing of areas and supply adequate quantity of water within the enclosed locality could be considered. This will prevent them from the attacks of stray dogs too,” said Mr. Ravindran. The forest officials have started setting up more water troughs exclusively for deer in Avinashi taluk. “We have now set up two large troughs and a few smaller ones, with them filled frequently. Setting up more provisions for water is also under consideration,” said District Forest Officer Mr. Periasamy. В Национальном парке Гвинди расположенном в окрестностях Ченнаи (Тамилнад, Индия) учеными собрана следующая статистика. 1. Численность антилопы гарна в 1990-х годах составляла более 35 особей, в 2006 году она сократилось до 12, а в 2014 году снова выросла до 30 и теперь составляет 21. 2. В 2007 году численность пятнистого оленя составляла более 266 особей. В 2017 - 175 особей. 3. Около 58% погибших животных умерло в результате нападения собак. 4. Количество бродячих собак в парке составляет 125. Из них 40 стерилизованы. 5. В период между 2013 и 2016 годами в парке погибли 220 пятнистых оленей и восемь антилоп гарна. CHENNAI: Can wildlife and stray dogs co-exist in the vast expanse of IIT Madras? The question attains significance with incidents of deer and black buck deaths at an all time high. Currently, there is a vertical divide with one group led by IIT’s wildlife club Prakriti demanding for dog-free campus and another group ‘Friends of Animals’, which enjoys the support of external animal rights organisations, stonewalling any attempt of the institute to relocate the strays. On Saturday, an emergency meeting was reportedly called by dean- administration Koshy Varghese. It was decided to rope-in Corporation dog catchers to relocate unsterilised dogs. Sources told Express the dean had requested other faculty members and students to get the job done without any fuss. Even a month ago, an all stake-holders meeting was organised by faculty association inviting noted biologist and animal behaviour expert Anindhya Sinha to discuss the issue and arrive at recommendations. However, the meeting concluded with no consensus. Early this month, AWBI secretary M Ravikumar wrote a letter to the IIT director Bhaskar Ramamurthi to implement the birth control programme for dogs. AWBI officials warn that if IIT-M takes any step, which violates PCA Act, the board will take-up the issue legally. Meanwhile, IIT-M has also decided to ban the movement of dogs in academic zones and seal the compound abutting Guindy National Park. However, the move has caused dissent within. Sujatha Chakravarthy of Friends for Animals said the dogs can be pushed out from blackbuck habitat and a few spots can be identified to feed the dogs, while Susy Varghese of Prakriti said 58 per cent of deaths caused were by dog attacks. Chennai: The forest department is readying an animal rescue and rehabilitation centre at the Guindy National Park. V Mohan, forest ranger, said a veterinarian will be posted at the centre to attend to the cases immediately. Endorsing the view that dog menace was the primary threat to wildlife, he said: “We get regular reports of animals bitten by stray dogs. Deer are very sensitive and die if not treated immediately,” he said.